Spiny Water Flea in our inland lakes. Help reduce the damage. 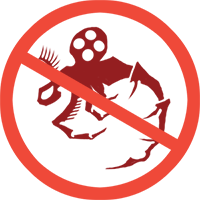 This video challenges boaters to help halt the spiny water flea from invading our lakes. It was produced by experts from UW-Extension and UW-Madison to urge boaters to adopt behaviors that will help stop the spread of a tiny, troublesome crustacean known as the spiny water flea. They can hurt our lakes by making the water greener and degrading fisheries. Always INSPECT, REMOVE, DRAIN, NEVER MOVE live fish, and always dispose of unwanted bait in the trash. Take these steps to comply with Wisconsin invasive species laws. Become a Clean Boats Clean Waters watercraft inspector and help other boaters stop the spiny water flea! Join the Citizen Lake Monitoring Network and help scientists look for the spiny water flea in new lakes. Order spiny water flea and other aquatic invasive species publications for free from the Wisconsin Department of Natural Resources. Listen to these aquatic invasive species songs to help you remember best practices to stop the spread of the spiny water flea and other invasive species. Tell your friends about the spiny water flea by sharing this video and website on Facebook and Twitter. Donate money to help us create new, fun ways to communicate about protecting our lakes. Learn more about the spiny water flea! The UW-Madison Center for Limnology calculated that it would cost millions of dollars to reverse the impacts of the spiny water flea in Lake Mendota. Watch Wildlife Forever’s Silent Invader episode on the spiny water flea to hear more from natural resource managers on the spiny water flea. The University of Wisconsin Sea Grant Institute has a quick rundown on the impacts of the spiny water flea. Learn about the status of the spiny water flea in Wisconsin using the Wisconsin Department of Natural Resources spiny water flea webpage. Learn about the national status of the spiny water flea using the USGS Nonindigenous Aquatic Species factsheet. This video is a product of a multidisciplinary collaboration between the University of Wisconsin-Extension, the UW Environmental Resources Center, the UW-Madison Department of Life Sciences Communications, the UW-Madison Center for Limnology, the UW Sea Grant Institute, and many other partners.